I hope you enjoy it as much as I did. Thanks Rob ! ! Picture a boat without a keel, being buffeted by wind and waves. Its motion is totally determined by outside forces as it slides across the water. A keel, however, helps steady a boat in relationship to the waves. It doesn’t rock and tilt as much, nor does it get thrown from its path as easily. And the deeper a keel is the more stable the boat will be. The analogy here to our spirituality is obvious as there is a similar relationship between our prayer life and the stability of faith that we enjoy each day. Like a keel, prayer prevents us from tilting too much or from overly rocking back and forth because of the wind and waves. It helps us move forward rather than slip to the side, or be overly determined by outside forces. 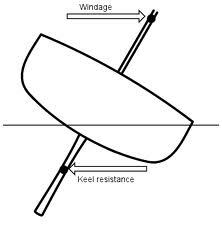 Keels create stability by also providing weight that significantly lowers the boat’s centre of gravity. One of the main determinants for stability in a boat is how deep it sits in the water. If the vessel sits on the surface of the water it will be less in charge of its movement than if it has ballast, and sits more deeply in the water. Prayer, too, gives us greater directional control and stability by anchoring us to a deeper place within ourselves. It establishes our lives at a more profound level, and the ballast it creates helps counter the many superficial forces that buffet us in our day. There is one more interesting feature in some keels that could also apply, at times, to our interactions with the world. Some boats have a retractable keel that can be lifted up in order to allow sailing in shallower waters. For people who have cultivated the virtue of a deep and even-keeled disposition in their lives, there might be times when it is also appropriate to pull up the keel in order to allow for more levity. It is good to live deeply within ourselves but it is also good to recognize when it might bAse better to adjust to the more shallow waters we find ourselves in. Today is the 3rd Sunday of Pascha. We are moving away from the tomb toward the Ascension of Jesus and Pentecost ten days later. Any yet, the Church brings us back to the tomb. Listen to another account of the visit of the Myrrhbearing women to the tomb from St. Luke. Why are we taken back to the tomb? Why go back to the place of death? 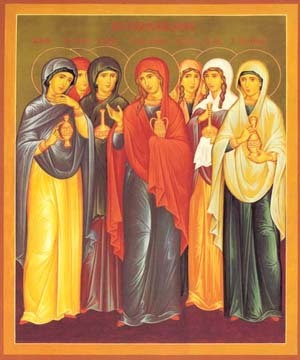 Why, in the middle of the celebration of the resurrection of Jesus, should we be commanded by the Holy Tradition to consider the example of these women? The Myrrhbearing women were expecting to find a dead body at the tomb. That is what they were seeking. They could not find what they were seeking and ask the angels what they had done with the body!! The Myrrhbearing women are driven by love for Jesus that is among the greatest expressions of it to be found in the Bible. But, that love was set within the context of expectations that are “out of sync.” with the truth of God’s purposes. I believe it has always seemed best to the Church and the Holy Spirit to remind us, in the midst of our Pascha excitement, of the need to ask the question of “expectations.” What do you expect to find in the lives of others, in your job, in your children, in your spouse, in yourself? That expectation/conviction of the truth will govern what you seek and what you offer and what you can see. The women did not recognize the angels as angels. Mary does not recognize Jesus as Jesus in another passage. The women are “perplexed.” They are expecting to find what they are seeking – death and defeat. Instead, they find life and victory. Their eyes and ours need to be opened. Their expectations and ours need to be challenged and changed. How else can they and we live in the midst of this present darkness with hope and resolve? How else can join with Christ in the expansion of His Kingdom? Are we trapped in our delusion; in the dead end of our delusional expectations? Is there no hope for God to break through? This question is crucial. Can a breakthrough happen? If so, how can it happen? God respects the integrity of our free will. He does not violate the boundaries we set. However, the light of His love, as we have learned, PRESSES upon us, seeking to find a place of entry. How were the eyes of the women opened? What made it possible for them to be changed?! How can the breakthrough into New Life occur? I propose there are a number of points in life where transformation is possible. “… in the face of hopelessness, these women act. They buy ointments that will help his body dry out as it decays, and sweet spices so that even in death, his body is honored. Their actions show their steadfast love for Christ, that even after hope is shattered, they go the extra mile to honor Jesus. Such is their love for this dead man. The Myrrhbearers were motivated by love. The love of the Myrrhbearers was shown in the context of what they believed was a massive and tragic defeat. They were not there to “get something.” They were there to give all they believed they could give. They were there to offer something – loving care for the dead body of their beloved Lord. Misguided expectations and convictions formed the context for their expression of love for their Lord. But, God used that serving love, misguided by inaccurate expectations though it was, to bring them to a deeper relationship with their Lord. What is the entry point the point where transformation is possible in your life? Where are your misguided expectations keeping you from seeing and responding to the risen Lord? You have been gathered to this Holy Table in this place, at this time, with these brothers and sisters. What and/or who do you seek? That depends on what/who you expect to find? What /who do you expect to find? Repent and believe the gospel – Christ is risen and so have you!! Expect resurrection and seek it. Seek and serve Him who is risen in all persons and all circumstances. How easy we forget. How often we need to be reminded. We need to visit the tomb – the place where crucifixion and resurrection meet – on a regular basis, not just once. This is the essence of the Divine Liturgy and the reason that it is celebrated on each and every Sunday, the Lord’s Day. But, as we do, let us do so with expectancy, to be reminded of, recommit ourselves to, and be nourish to participate in the victory of Christ’s resurrection, not to mourn defeat or with resignation to the inevitability of sin and death in our life. Thanks be to God for His merciful reminder and challenge. Repent and believe the Gospel. Christ is risen! He goes before you and is in whatever you face. Serve Him in the place to which He has instructed you to go. He will meet you there!! Note: I realize that in the course of writing posts for this blog that the convictions I share may inadvertently conflict with the Holy Tradition. I stand joyfully under the authority of this Tradition to test my words. If, in any way I have erred, I stand joyfully corrected. Lord have mercy on me a sinner. One of my favorite ways to become present to Christ Jesus and enter into effective prayer is to listen to monastic chanting and chant my prayers. Having a voice and using that voice is an essential part of being human. Obviously, I am not just talking about the use of our vocal chords. Our whole life, as St. Francis is famous for having said – the way we live our life, is a sermon. That sermon is the song of our life – a chant. Chanting, literal and figuratively is, therefore, a natural part of being human. 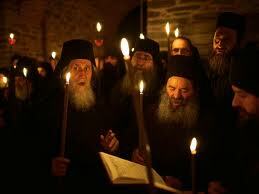 As disciples, ours is the victory song of the death and resurrection of our Lord Jesus Christ. Save us, we beseech thee, O LORD! Blessed be he who enters in the name of the LORD! Sing to the Lord a new song; his praise is in the assembly of the saints. We are urged to sing a new song to the Lord. This new song is the song that has been learned by the new man. Now a song it is a thing of joy; more profoundly, it is a thing of love. It is the person who has learned to love the new life who has learned to sing the new song. In order to be able to sing the new song, therefore, we need to be reminded of the nature of the new life, for the new man, the new song, the new covenant, all belong to the same kingdom. Not only, then, will the new man sing the new song, he will also belong to the new covenant. There is no one who does not love something, but the question is, what to love. The psalms do not tell us not to love, but to choose the object of our love. But how can we choose unless we are first chosen? We cannot love unless someone has loved us first Listen to the Apostle John: We love him, because he first loved us. The source of our love for God can only be found in the fact that God loved us first. He has given us himself as the object of our love, and he has also given us its source. What this source is you may learn more clearly from the Apostle Paul who tells us: The love of God has been poured into our hearts. This love is not something we generate ourselves; it comes to us through the Holy Spirit who has been given to us. Since we have such an assurance, then, let us love God with the love he has given us. As John tells us more fully: God is love, and whoever dwells in love dwells in God, and God in him. It is not enough to say: Love is from God. Which of us would dare to pronounce the words of Scripture: God is love? He alone could say it who knew what it was to have God dwelling within him. God offers us a short route to the possession of himself. He cries out: Love me and you will have me, for you would be unable to love me if you did not possess me already. My dear brethren and children, fruit of the true faith and holy seed of heaven, all you who have been born again in Christ and whose life is from above, listen to me; or rather, listen to the Holy Spirit saying through me: Sing to the Lord a new song. Look you tell me, I am singing. Yes indeed, you are singing; you are singing clearly, I can hear you. But make sure that your life does not contradict your words. Sing with your voices, your hearts, your lips, and your lives: Sing to the Lord a new song. Now it is your unquestioned desire to sing of him whom you love, but you ask me how to sing his praises. You have heard the words: Sing to the Lord a new song, and you wish to know what praises to sing. The answer is: His praise is in the assembly of the saints; it is in the singers themselves. If you desire to praise him, then live what you express. Live good lives, and you yourselves will be his praise. Source: St Augustine, Sermon 34, 1-3.5-6 (CCL 41:424-426); Word in Season III, 1st ed. The Lord continue to bless you for resurrected living in the warp and woof of everyday life. As I have continued to reflect on the subject of knowledge and knowing, more has come to mind worth, at least in my estimation, worth mentioning. Even though I know by means of realizing that I don’t know that does not exclude the fact that some aspects of the truth are comprehensible. Not everything is all that mysterious even though it finds its meaning in the context of all that is incomprehensible. For example, it is a pretty understandable concept that reading the same select passages of Scripture that are our favorites is not a healthy way of relating to the Word of God. The Holy Tradition teaches and offers us a systematic and thorough exposure to the Word that, in its own way, works transformation in our life. Pretty understandable. No big mystery. Of course, HOW the Word transforms us through the use of a lectionary and seasonal schedule of reading IS Mysterious. I am sure you can come up with your own examples. The truth is transformative by its very nature. The truth is intended to be shared in order to bless everything and everyone around it. The truth shines in the darkness banishing the darkness in which it exists. The truth extends, reaches out, and establishes itself ever more fully. In the human arena this involves communication. Most often when we think of communication we think of the use of language and the verbal/written articulation of our convictions and ideas. This is right and proper. But, and here we find ourselves dealing once again with knowing and unknowing, the use of language is, at one and the same time, both necessary and inadequate. When we realize and embrace a new aspect of the truth we immediately want and need to express it. Why? Because it has changed us. Remember, the truth by its very nature is transformative and expansive; transforming what it encounters into the reflection of itself, filling it, and expressing itself through what it fills and transforms. But the truth is always bigger, deeper, and more all encompassing than our words no matter how accurate. And so, we must speak and yet we fall short in our speaking. The truth is imminent and yet transcendent in verbal and written communication. We must but we can’t. Such a necessity and such an inadequacy, though it is inherent in our verbal and written attempts at communicating the truth provoke and draw forth from deep within us ongoing efforts to articulate and communicate the truth. If we legitimately obey this yearning without seeking to “conquer” the truth, deeply human artistry is the fruit. Something transcendent does, in fact, get communicated even though the words fall short. I hasten to also add, with regard to the temptation to “conquer” or “contain” the truth in the clothing of words, that there is, in my estimation, a movement to do just that at the expense of an appreciation of the other ways in which the truth seeks to have itself communicated. The inevitable method is to “reinvent” language or adopt “more relevant” language in an attempt to effectively communicate the truth to a “target audience.” Of course, the translation of the Good News into the vernacular language of the people to whom we desire to speak is authentic. However, seeking to invent language to adequately do so as if that is the only way the truth can be communicated is an error of immense proportions. The whole of the universe, in essence, is meant, to communicate – to testify effectively – the truth in addition to verbal and written communication. Words effectively communicate some aspects of the truth. And, all the time, some aspects of the truth are best communicated not through words or writing but in some other way. Once again, the temptation afoot (it has always been afoot) is to think that all of the things on the list above are extra or optional and even detrimental ways of communicating (witnessing the truth). The Holy Tradition is “the living witness to the living faith.” It is unchanging and yet ever changing and developing in ways that are deeply authentic and interiorly harmonious with the truth and the other aspects of the Tradition. My words fall short to communicate what I intend and yet I hope they have been able to pass on something of what I have come to realize throughout my life. If we seriously reflect on all of the passages that make up the post resurrection narrative in the four gospel accounts, we will unquestioning struck by the level of “not knowing” or “not getting it” of the disciples. The relationship of the disciples with the risen Lord Jesus did not, apparently, serve to “clear things up.” As a matter of fact, it could be proposed, it made matter worse!! I always find it to be reassuring that I am invited to give thanks not only what I know but what I do not know but are, nonetheless, true, governing my life and filling it with mysterious meaning and purpose. I am encouraged to give thanks for the limitations of my knowledge as a human being. Such a limitation is, according to the Holy Tradition, not an aspect of fallenness or brokenness I or the Lord needs to fix or heal. We must extend our search for meaning and knowledge beyond and outside the parameters of time and space to, in any practical way address the dilemma of dealing with our own subjectivity. We must plunge ourselves into the fathomless and eternal waters of the Mystical Tradition in all of its tangible aspects. The paradox is that we do not even know that that is what we must do unless we have already done it. Subjectivity and objectivity coexist within the human, not in a balance or tension as if they seek to overcome one another, but in a mysterious union in which they inform and deepen our experience of the other. Pun on the phrase “the other” is intended. In order to know we must know that we do not know. It is out of a life dedicated to the cultivation/integration of this conviction and reality that such classics as, The Cloud of Unkowning spring forth. Dare I exclude all of the human authors of the books of the Bible and the mystical prayer life that is the one of the Church’s most precious treasures?! This is the invitation, promise, and challenge of the season of Easter – resurrected living. Let us endeavor with all our might, strengthened by the grace of the Holy Spirit, to say a consistent “yes” to the invitation to live resurrected lives… Let us do so motivated by the promise echoing elegantly in our hearts and minds. Let us pray that the Lord will direct our steps in the way that not only leads to salvation but the working out of our salvation with fear and trembling. O Lord my God, I will sing to you a funeral hymn, a song at your burial: for by your burial you have opened for me the gates of life, and by your death you have slain death and hell. All things above and all beneath the earth quaked with fear at your death, as they beheld you, my Saviour, upon your throne on high and in the tomb below. For you lie before our eyes in a way beyond our understanding: a corpse and yet the very source of life. Today you keep holy the seventh day, which you blessed of old by resting from your works. You bring all things into being and make all things new, observing the sabbath rest, my Saviour, and restoring your strength. You have gained the victory by your greater strength: your soul was parted from your body yet by your power, O Word, you have burst asunder the bonds of death and hell. Hell was filled with bitterness when it met you, O Word, for it saw a man deified, marked by wounds yet all-powerful; and it shrank back in terror at this sight. You were torn but not separated, O Word, from the flesh you had taken. For though your temple was destroyed at the time of your Passion, the person of your Godhead and of your flesh is one: in both you are one Son, the Word of God, both God and man. The fall of Adam brought death to man but not to God. Hell is king over mortal men, but not for ever. Laid in the tomb, mighty Lord, with your mighty hand you burst asunder the bars of death. To those from every age who slept in the tombs, you have proclaimed true deliverance, O Saviour, who have become the firstborn from the dead. Be astounded, O heavens, and let the foundations of the earth be shaken. He who dwells on high is numbered among the dead and dwells as a stranger in a narrow tomb. The second Adam, he who dwells on high, has come down to the first Adam in the depths of hell. The disciples’ courage failed, but Joseph of Arimathea was more bold; for seeing the God of all a naked corpse, he asked for the body and buried him. Coming forth from a birth without travail and wounded in your side with a spear, O My Maker, you have brought to pass the re-creation of Eve. Becoming Adam, you have in a way surpassing nature slept a life-giving sleep, awakening life from sleep and from corruption by your almighty power. ‘O Son without beginning, I was blessed by your strange birth in ways surpassing nature, for I was spared all travail. But now looking upon you, my God, as a lifeless corpse, I am pierced by the sword of bitter sorrow. But arise, that I may be truly magnified. I am so grateful for the liturgical tradition. It provides words that, first, far exceed and powerfully express my deepest longings; and second, I can confidently inhabit that will offer the matrix within which my longings have the opportunity to be fulfilled beyond what I could ever ask or imagine. When our Lord was handed over to the will of his cruel foes, they ordered him, in mockery of his royal dignity, to carry the in­strument of his own torture. This was done to fulfil the prophecy of Isaiah: A child is born for us, a son is given to us; sover­eignty is laid upon his shoulders. To the wicked, the sight of the Lord carrying his own Cross was indeed an object of derision; but to the faithful a great mystery was revealed, for the Cross was destined to become the sceptre of his power. Here was the majestic spectacle of a glorious conqueror mightily over­throwing the hostile forces of the devil and nobly bearing the trophy of his victory. In the words of the Apostle: Christ our Passover is sacrificed. As the new and authentic sacrifice of reconciliation, it was not in the Temple, whose cult was now at an end, that he offered himself to the Father; nor was it within the walls of the city doomed to destruction for its crimes. It was beyond the city gates, outside the camp, that he was crucified, in order that when the ancient sacrificial dispensation came to an end a new victim might be laid on a new altar, and the Cross of Christ become the altar not of theTemple, but of the world. You drew all things to yourself, Lord, when all the elements combined to pronounce judgment in execration of that crime. Figures gave way to reality, prophecy to manifestation, Law to Gospel. You drew all things to yourself in order that the worship of the whole human race could be celebrated everywhere in a sacramental form which would openly fulfil what had been enacted by means of veiled symbols in that single Jewish Temple. Source: St. Leo the Great, Sermon 59.4-6 – Weds in HWK 444 (PL 54:339-341); Word in Season II, 1st ed. The ancient proclamation of Pascha (Easter) is “Christ is risen from the dead, trampling down death by death…” WHAT?! Death is conquered by death?! Therein lies the fulfilment of the Old Covenant in its priestly, kingly, and prophetic aspects – “Behold the Lamb of God!” and “Behold your King!” Power is made perfect in weakness. Life poured out in the face of, and, most importantly, at the hands of the triad of faithlessness, resignation, and fear which seeks to offer themselves as the way to preserve life, is the actual way of true life. “The Lord God omnipotent reigneth!” from a cruciform throne. Take hold of your time today and dedicate a portion of it to the contemplation and veneration of the Holy Cross of our Lord Jesus Christ. Read read Isaiah’s prophecies concerning the Messianic Suffering Servant ( Is. 42:1-4; 49:1-6; 50:4-9; 52:13-53:12). God the Father is glorifying the Son and Himself by the power of the Holy Spirit on the cross yesterday, today, and forever. Alleluia, Alleluia, Alleuia!! Let God arise! And let His enemies be scattered! And let those that hate Him flee from His presence! For you drive away the demons by the power of our Lord Jesus Christ crucified on you, who went down to Hell and trampled on the power of the devil, and gave us you, His venerable Cross, for driving away all enemies. O most precious and life-giving Cross of the Lord, help us! – with our Holy Lady the Virgin Mother of God, and all the Saints throughout the ages. Amen. Guard us/me by the holy and life-giving Cross and keep us from all evil. Into Your hands, O Lord, I/we commit my/our spirit. 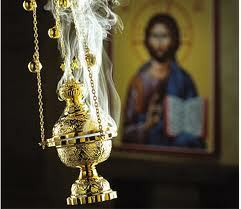 Bless us, save us, and grant us eternal life. Amen. “The evening before our Lord gave himself up to death he shared his own body with his Apostles and offered them his blood, with the command that they were to do what he had done in order to keep the memory of his Passion alive. Then a strange thing happened. Earlier Jesus had charged his disciples not to fear death. Do not be afraid of those who have power to kill ­your body, he had said. But now he himself showed fear, and ­begged to be spared the cup of suffering. Father, he prayed if it be possible, let this cup pass me by. How are we to explain this? The answer is that our Lord’s petition was wrung from the human weakness he had made his own. There was no pretence about his incarnation; it was absolutely real. And since the donning of our poor humanity had made him puny and defenceless, it was only natural that he should experience fear and alarm. Eating to alleviate hunger, showing weariness after exertion, and revealing human weakness by the need for sleep were all the effects of his taking our flesh and clothing himself with our infirmity. Consequently when the moment of death drew near, he necessarily experienced the ultimate frailty of our human condition; he was gripped by a dreadful horror of ­dying. A further answer to our question is that Jesus wished to teach his disciples how to commit themselves to God both in life and in death. His own divine knowledge made him supremely wise, yet he prayed for what his Father judged to be expedient. How much more ought we ignorant men to surrender our wills to God’s omniscience! We may also tell ourselves that we too were in our Lord’s mind as he prayed. In time of temptation our minds become confused and our imagination runs riot. By persevering in prayer Jesus was showing us how much we ourselves need to pray if we are to escape the wiles and snares of the devil. It is only by constant prayer that we gain control of our distracted thoughts. Finally, there is our Lord’s desire to strengthen all who are afraid of death. By letting them see that he himself had expe­rienced fear he would show them that fear does not necessarily lead to sin, provided one continues to resist it. This is the force of our Lord’s concluding prayer: Not my will, Father, but yours be done. He is saying: ‘Yes, Father, I am ready to die in order to bring life to many.’” Source: St Ephrem of Syria, Diatessaron 20.3-4, 6-7 (CSCO 145:201-204); Word in Season II, 2nd ed.